Kayla Sharples heads a ball away. The junior defender and the Wildcats dropped their Big Ten opener at Penn State. Barely three minutes had passed when No. 8 Penn State struck its first blow against Northwestern (3-4-1, 0-1 Big Ten) and its Big Ten championship aspirations. Still, the Wildcats, the reigning conference co-champions, are staying true to their preseason expectations and dismissing any sense of disbelief. 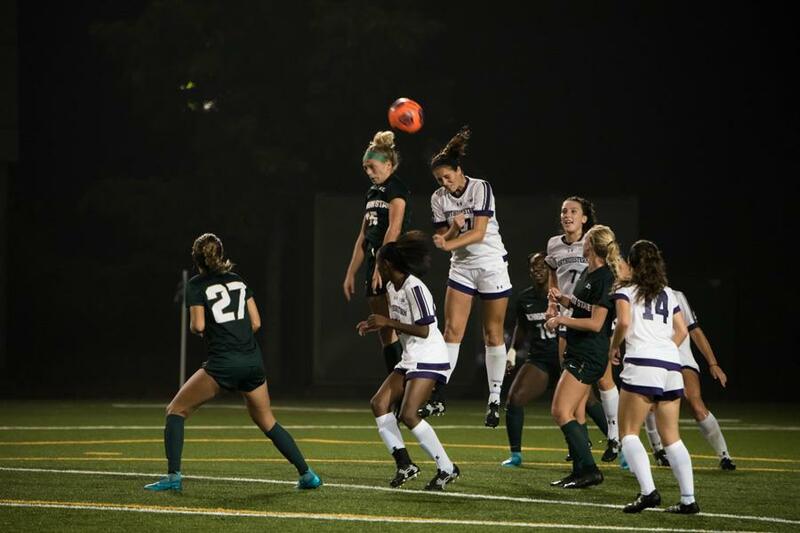 NU lost 3-0 to the Nittany Lions (5-2-0, 1-0) on Thursday in State College. Even though the two teams shared the Big Ten championship last season, Penn State, the conference’s highest ranked team, made a strong impression to start its Big Ten slate. In the third minute, Penn State forward Megan Schafer scored on a header off a cross from defender Brittany Basinger. Emily Ogle’s free kick goal from 24 yards in the 41st minute put a close to a first half that Sharples and coach Michael Moynihan acknowledged was dominated by the Nittany Lions. Penn State had more shots on goal in the first 20 minutes of the match than they had in any half all season and tallied 15 of its 17 shots in the opening 45 minutes. Then, the Nittany Lions scored two minutes into the second half, when Charlotte Williams knocked it past senior goalkeeper Lauren Clem from eight yards. The Cats shared the Big Ten championship last season with Penn State, but the Nittany Lions showcased their improvement throughout the match. Penn State returns four players who missed last season to play in the FIFA U-20 Women’s World Cup, Moynihan said. While NU did not face the Nittany Lions in 2016, the Cats only lost once last year against a conference opponent. NU’s upcoming matches are against Ohio State, who received votes in this week’s poll, and No. 13 Rutgers, so the Cats’ loss in the Big Ten opener, along with their losing record overall, prompts urgency.